Glow-in-the-dark UV American-style table, available in 3 different sizes! Glow in the dark finish for use with black lighting. Solid plywood frame coated in quality Formica. The Cosmic is one of the UK & Europe's biggest selling American style pool tables and has an extra edge as this table glows in the dark! Stunning ultra violet effects will attract players to this table and the speed and fun of the game will make them want to return again and again. Perfect for a black light themed games room and enjoyable and rewarding to all standards of player from the true novice to tournament champions. One Spots & Stripes UV glow-in-the-dark pool ball set. When choosing you table it is important to consider the size of the room or site you would like to place it in. 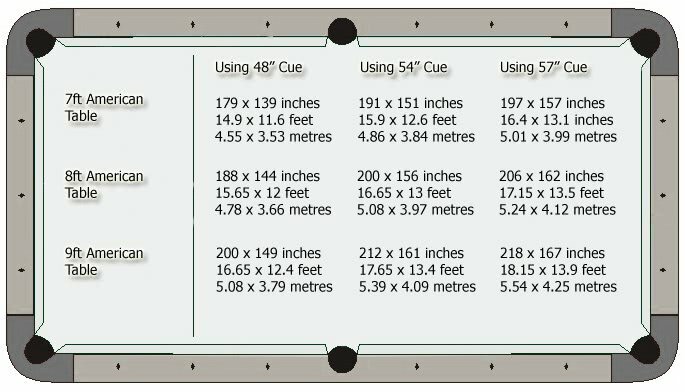 It is recommended that there is enough room to fully extend a pool cue from the outside edge of the table to the wall. The Cosmic pool table is supplied as standard with 2 cues, 1 set of pool balls, a triangle and chalk. There are many additional pool table accessories available to augment and increase your enjoyment of your pool table. The Cosmic is bespoke built to order depending on your choice of table size, finish and cloth colour in an Italian based factory.